Members from the Sigma Chi Fraternity, representing 37 chapters from across the nation, visited Huntsman Cancer Institute (HCI) to dedicate the Sigma Chi Friendship Garden at the Primary Children’s and Families’ Cancer Research Center at HCI. During their visit, the group was also inducted into the HCI Sigma Chi $20K Club or $50K Club, representing their chapters who have raised either $20,000 or $50,000 for cancer research throughout the 2017-2018 school year. In total, the Sigma Chi Fraternity raised $1.85 million for cancer research in the 2017-2018 school year. In 2015, the fraternity made a 7-year commitment to raise $11 million for HCI. To date, Sigma Chi has raised $7.6 million of the $11 million pledge. 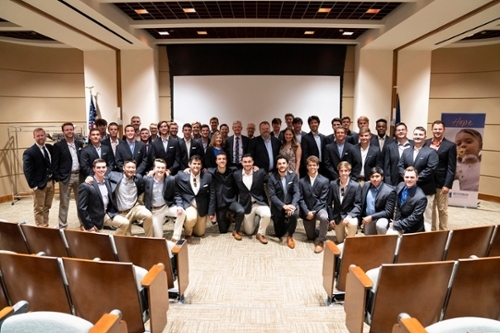 Learn more about Sigma Chi's partnership with Huntsman Cancer Institute.